The initial enquiry came from our client in April 2018. 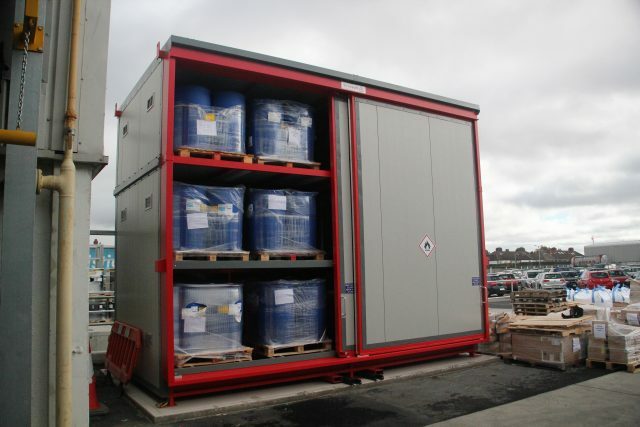 The requirement was for an external storage facility for palletised drums of hazardous flammable materials. This was currently being stored off-site therefor the client was looking to reduce the cost incurred by this. A site visit was requested by the client to explore the possibility/suitability to store the materials on site. Our Design Engineering Declan O’Connor attended site in April 2018. During the site visit, a walk-through was carried out to identify potential areas for a storage unit to be positioned. 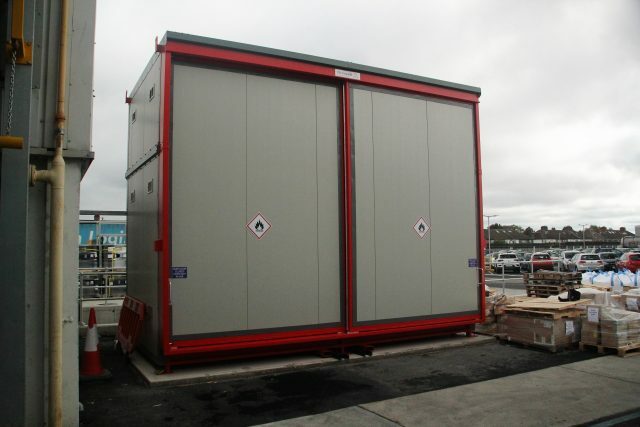 As yard space was an issue for the client, Chemstore offered a 3-Tier Bunded Store. To make it possible for the client to position the store in an area of high traffic flow, a Firevault was recommended for the project. This also made it possible to position the unit directly outside the wall of the factory. The Firevault was manufactured in two sections by our design team and our engineers assembled the certified Fire Rated unit on site in one day. The Firevault is designed in accordance with EN, DIN & BS standards and the Firevault wall panels are tested to IMO FTP A60 standard therefor, designed to withstand a fire for 90 minutes ensuring that the flammable and critical materials stored in the unit are isolated from a blaze giving enough time for an emergency response team to extinguish any hazardous fires. A live racking system was also offered to the client to allow storage in double depth, as access to the store would only be possible from one side. 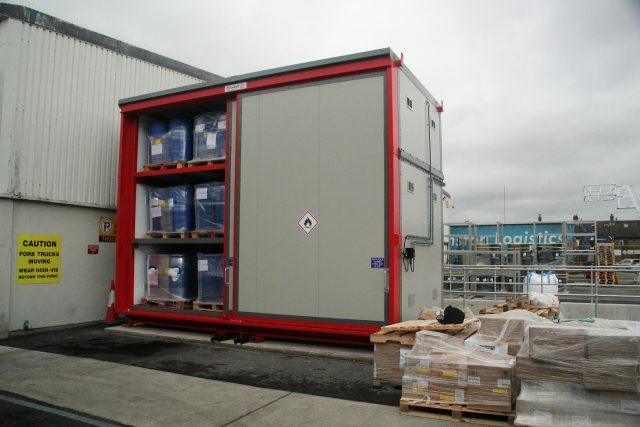 The result for the client was a fully compliant & certified unit for storing their critical material on site. 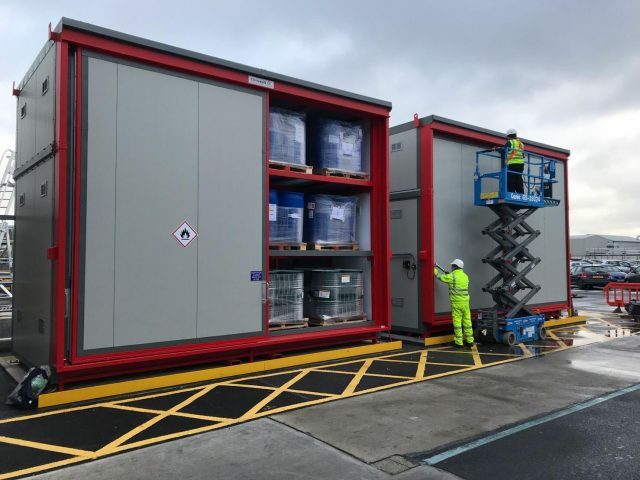 This resulted in lowering their storage costs & also reduced the time involved in retrieving the materials upon requirement by their production team.